(255 x 350 mm) 12 x 17 in. Gyalwa Gyatso (Skt. Jinasagara), meaning the 'Conqueror-ocean', is a four-armed manifestation of red Avalokiteshvara with his consort, whose practice is of particular importance in the Karma Kagyu tradition of Tibetan Buddhism. Gyalwa Gyatso is a yidam deity of the 'father-tantra' class of Highest Yoga Tantra deities, which emphasizes the development of compassion or 'skilful means' (upaya). The Tibetan lineage of this deity stems from Milarepa's disciple Rechungpa, who was destined to receive the last five Tantras of 'the nine-fold teaching cycle of the formless dakinis' from the Indian mahasiddha Tiphupa. Because of a restrictive vow Milarepa had only received four of these nine secret tantric transmissions from his teacher Marpa, who in turn had received them from Tilopa's disciple, Naropa. One of these five Tantras included the practice of Jinasagara or Gyalwa Gyatso, which Rechungpa also received instructions on from the Indian scholar, Sumatikirti. Tiphupa, the 'pigeon-man', was actually the miraculous 'rebirth' of Marpa's own son, Darma Dode, who was mortally wounded in a riding accident. Through the practice of phowa, Darma Dode projected his consciousness into the body of a dead pigeon, which then flew over the Himalayas to enter and revive the fresh corpse of a sixteen-year-old Brahmin boy at the 'Cool Grove' charnel ground in India. From Rechungpa the lineage transmission of Gyalwa Gyatso then passed to the second Karmapa, Karma Pakshi (1203-1283). However, it is also believed that the great yogin who was the previous incarnation of the first Karmapa, Dusum Khyenpa, attained great realization through the practice of Gyalwa Gyatso. Dusum Khyenpa (1110-1193) was recognized as the first Tibetan tulku, or incarnate lama, who left a letter of prediction for his next future rebirth. All of the seventeen incarnations of the Gyalwa Karmapa, and the fourteen incarnations of the Dalai Lama, are equally recognized as being manifestations of Avalokiteshvara, the bodhisattva of great compassion. But while the Dalai Lama is traditionally identified as an emanation of four-armed white Avalokiteshvara (Tib. Chenrezig), the Karmapa is more commonly recognized as the four-armed red emanation of Gyalwa Gyatso. This thangka depicts Gyalwa Gyatso at the centre of his nine-deity mandala. He is ruby-red in colour, with four arms and two eyes, and he sits in vajra-posture upon a white moon disc and multicoloured lotus in sexual union with his white consort, Vajrayogini. He is adorned with the five divine silk garments and eight jeweled ornaments of a sambhogakaya deity. With his first two hands palms-folded he clasps a blue wish-granting gem in front of his heart, while with his second pair of right and left hands he holds aloft a golden five-pointed vajra and a red lotus. His consort, Vajrayogini, is semi-wrathful, with three eyes, and a slightly reddish-white complexion. Her naked body is adorned with the five bone ornaments, a five-skull crown, and a garland of fifty dry white skulls. With her left and right hands she holds aloft a skull-cup full of blood and a curved knife. In the four cardinal directions are four smaller manifestations of red four-armed Avalokiteshvara, each of which are similar in appearance to the main deity, except that they hold crystal rosaries in their second right hands and have different consorts. The colours of each of these 'Four Mothers' or consorts correspond to the four directions, they are all peaceful in appearance with two eyes, and are adorned with the divine silk and jeweled ornaments. In the east (bottom) is blue Locana, who holds aloft a lotus and her emblem of a golden wheel. In the south (left) is yellow Vajradhatvishvari, who holds aloft a lotus and her emblem of a radiant jewel. In the west (top) is red Pandara, who holds aloft two red lotuses. And in the north (right) is green Tara, who holds aloft two utpala lotuses. In the four inter-cardinal directions are the sambhogakaya manifestations of the 'Four Buddhas', who each sit in sattva-paryanka posture holding a lotus and their specific right hand attribute. In the southeast corner is blue Akshobya, who holds a golden vajra. In the southwest corner is yellow Ratnasambhava, who holds a blazing jewel. In the northwest corner is red Amitabha, who holds a red lotus in a golden vase. And in the northeast corner is green Amoghasiddhi, who holds a fiery sword. Seated amidst a circle of rainbow light at the top centre is Shakyamuni Buddha, with Gampopa and the First Karmapa, Dusum Khyenpa, appearing to the left and right below. 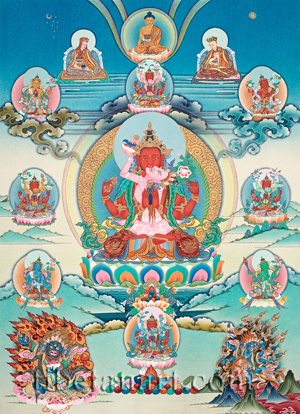 In the bottom left corner is the principal male protector of the Karmapa lineage, Dorje Bernagchen, the 'black-cloaked vajra', who is extremely wrathful, blue-black in colour, and wields a crescent-shaped chopper and a skull-cup of blood in his right and left hands. And in the bottom right corner is Dorje Bernagchen's consort, the wrathful female protector Shri Devi (Tib. Paldan Lhamo), in her aspect as Rangjung Gyalmo. She is extremely wrathful, four-armed, blue-black in colour, black-cloaked, and rides her mule across an ocean of blood amidst a maelstrom of wind and fire. In her two right hands she holds a trident and a ritual dagger, and in her two left hands she holds a divination mirror and a serpent-noose.